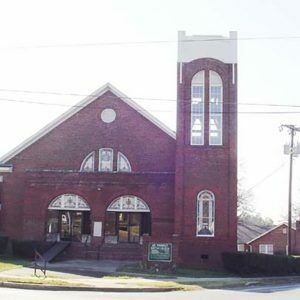 This church was founded in 1883 and formally organized as First Baptist Church, Colored, in 1885. It was later renamed Mt. Prospect Baptist Church. In 1891 Mount Prospect hosted the first classes of Friendship College, founded by Rev. M.P. Hall to offer an education to Rock Hill blacks before there was a public school for them. The school held classes here until 1910. The second church burned in 1914 and this brick church, with Romanesque Revival elements, was built in 1915. It was listed in the National Register of Historic Places in 1992.